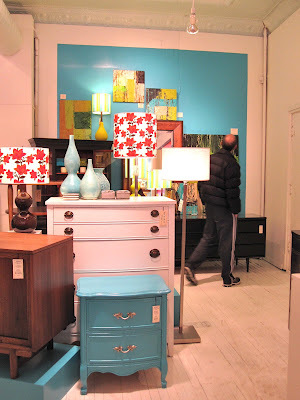 The entire store is filled with refurbished vintage furniture. And we're not talking restained to a deep espresso or whitewashed to look farmhouse chic. I am talking purple, yellow, and turquoise pieces! As most bloggers do... I. Love. Painted. Furniture. Turquoise and red everywhere! Remind you of anything? I loooved this nightstand. 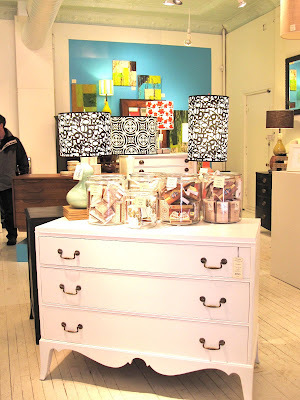 The white drawer on dark wood pairing reminded me of this fantastic IKEA nightstand makeover. File that one away for later use. More white drawers on a dark base. 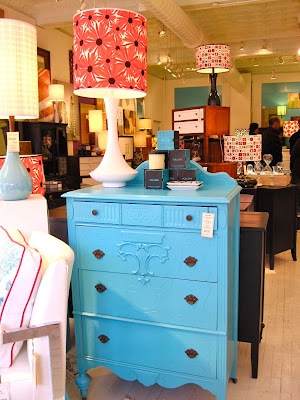 I so need a chest of drawers exactly like this. Unfortunately this was a tad too costly. 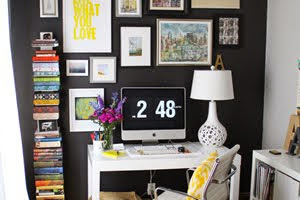 Add this one to the inspiration files, as well! My best friend loves purple and Chicago. I'm not sure there is a more perfect work of art out there for her. That starburst mirror is pretty fantastic also! Love these hourglasses. This is the second store I've seen them in in the past two weeks. Pottery Barn also carries one. I think they're great accent piece for bookshelves or a fireplace mantel. 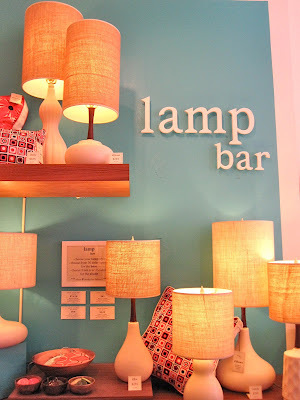 My favorite part of the store is the Lamp Bar, shown above. According to the website, the lamp bar is a mix-and-match selection that offers "17 ceramic bases in 30 different colors, 5 shade sizes, and close to 100 shade options." This genie-in-a-bottle shape is my favorite. So many colors from which to choose. Obviously I'd go with yellow. That one piece of art is perfect for me...sigh. I love this post- it is one of my favorites! 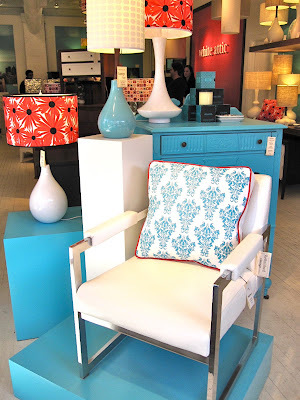 oooh... love all the turquoise! what are the prices like at this place? 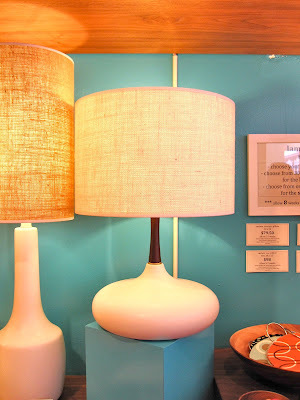 Thanks for the good find ~ I'll have to make a trip up to A-ville as we figure out new lamps for our new place! Such a cute store! We need a place like that in DC! I absolutely LOVE this post!! Definitely a highlight on a winter's day! What a beautiful store... wish we had one like it here in SF! omg i wish i could go to this store!! sooo gorgeous! I love White Attic. 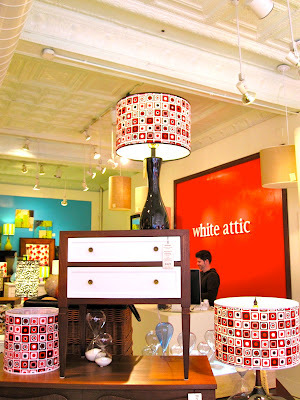 I've been coveting their red patterned mix-and-match lamp shades for quite some time. 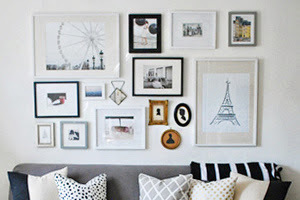 I've also gotten some great ideas for diy projects. I'm going to make my first stab at repainting an old chest-of-drawers this summer.